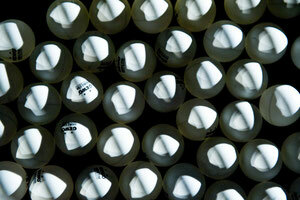 Ping pong balls have mostly similar physicalities. They weigh around 2.7 grams, and are 40 mm in diameter. They can take distance, by rolling along the floor, by flying in a curve-like movement or by leaping through the space. Once dropped from 30 cm they only rise up 23 cm. On each bounce the height decreases according to this coefficient, until they cannot rise off the floor anymore. However, the specificities of the bounce depend largely on the ground surface. On the right dance floor they produce a hollow staccato sound on each touch. They are highly dependent on the strength of the initiating force that gives them the strength to fight friction. Eventually, due to the friction between them, the ground and the air, they come to a stop. Once they are in groups they behave unpredictably, and, sometimes, they deviate from their original trajectory. Ballroom was coproduced by LOOPING (a project developed by Uzès danse CDC, in partnership with TanzWerkstatt Berlin and O Espaço do Tempo) and Jardin d'Europe, with the support of the Culture Programme of the European Union.